UPDATE: Ame is now permanently closed. I will leave this article up for posterity. I keep going on loops and I feel that Google maps is taking me the wrong way over and over again. In the meantime it is raining so much and the wind is so strong, typical of the Bay Area, that I can’t fathom getting out of the car. Eventually I realize I have been missing the same turn the lat 3 times so I get out of the loop and finally park the car. I will find the restaurant faster on foot. I miscalculate the rain and wind combo and after walking for just 5 minutes and trying to duck into the entrances of places I make it to the St. Regis Hotel lobby looking like a wet chicken. Not quite the fabulous entrance that I had in mind but at least I am there. The lobby is bubbling with people chatting away and brandishing wine and cocktail glasses. Friscos’ entrepreneur elite and hopeful investors are welcoming the weekend in the only way possible: raising a glass. I quickly find a restroom to center myself and try to look as unfazed as possible but my hair is not cooperating. I try to style it as if I was wearing a tone of gel and it kind of does the trick. I follow a dimmed corridor into the hotel’s entrance to Ame, Doumani and Sone‘s outpost in the city. Before sitting down at the bar I had little knowledge about Ame’s background. I had heard it was a good restaurant and that it had been graced by a Michelin star almost since its opening but little did I know that this was one of those places that takes you on a journey beyond the food. Ame is the sibling of long standing Napa institution Terra. Opened in 1988 by the restaurateur couple Lissa and Hiro Terra has advocated for Napa’s produce and traditions and professes a New American cuisine touch. Coming from a hospitality family and being the daughter of Stag’s Leap Winery owner, Lissa grew up surrounded by produce, kitchen noise and cooking pots. 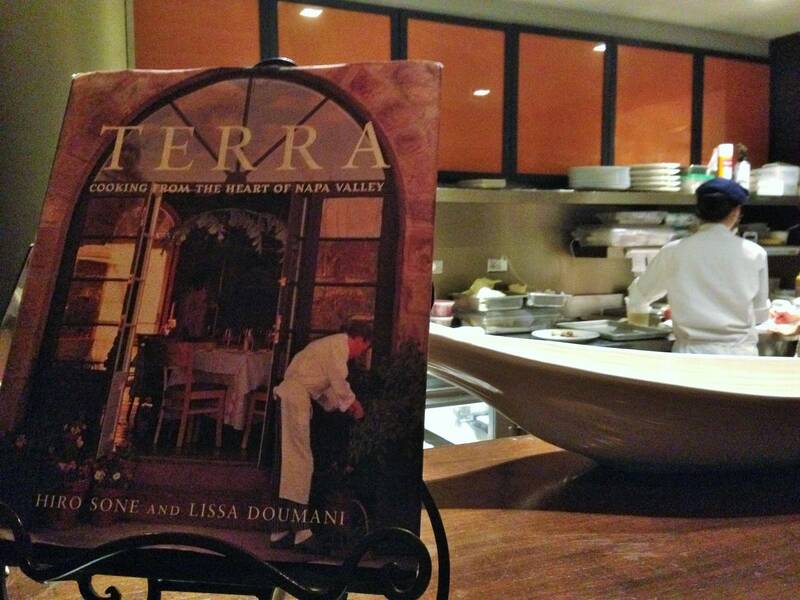 Hiro and Lissa met in Japan in a kitchen and a few years later opened their Napa restaurant. Although it is Friday night the restaurant is not full. Its open plan kitchen is perfect for solo diners and casual dates. When I am seated there is already another businesswoman at the other end of the bar and a couple, who talk and look as if they had just met, joins us later. He is loud, talkative and stand-offish and at the first opportunity, starts a conversation with the solo lady and enthusiastically chats away. His date is wearing a skirt that is too short and too tight and looks visibly uncomfortable on the high chairs. I focus on the kitchen, observing the skillful Japanese chef. “Sorry, there is no sushi on the menu” I hear the waiter advise to my neighbours. 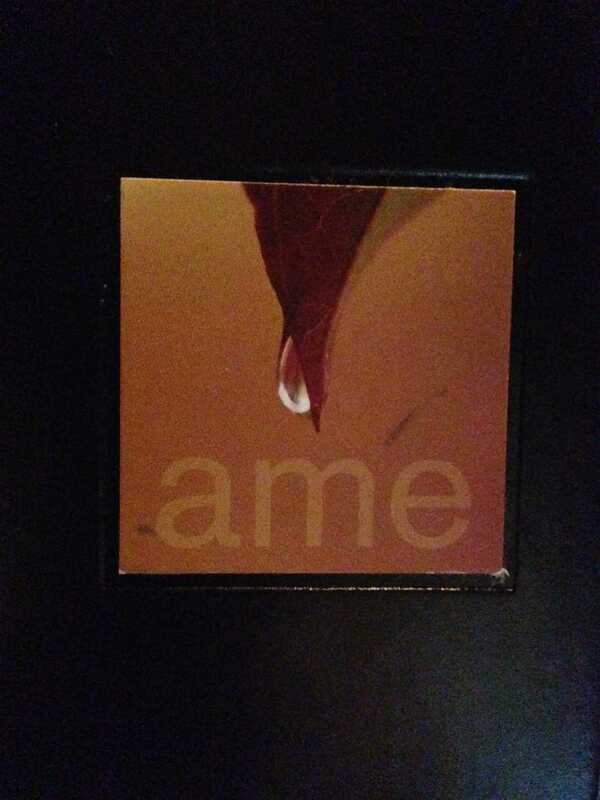 Ame’s menu is eclectic and interesting. It combines a lot of the types of food that I like: farm to table fresh seasonal dishes with a touch of Japanese character and a touch of Mediterranean feel. I hear, repetedly, that they specialize in New American cuisine. To me, this could mean anything as American food could include nachos, ceviche, hot dogs or burgers for all I know. I would however not think of Japanese dishes as New American cuisine. But maybe that is just me. Regardless of definitions this is a great menu many of the options of which I am debating to sample. I settle for the waiter’s recommendation. I have recently started to rely on crowd-sourced meals assuming that what is ordered most often may just be the best prepared or most delicious dish. I presume this may not be the best way to go at certain watering holes but on this trip it has been a good strategy. 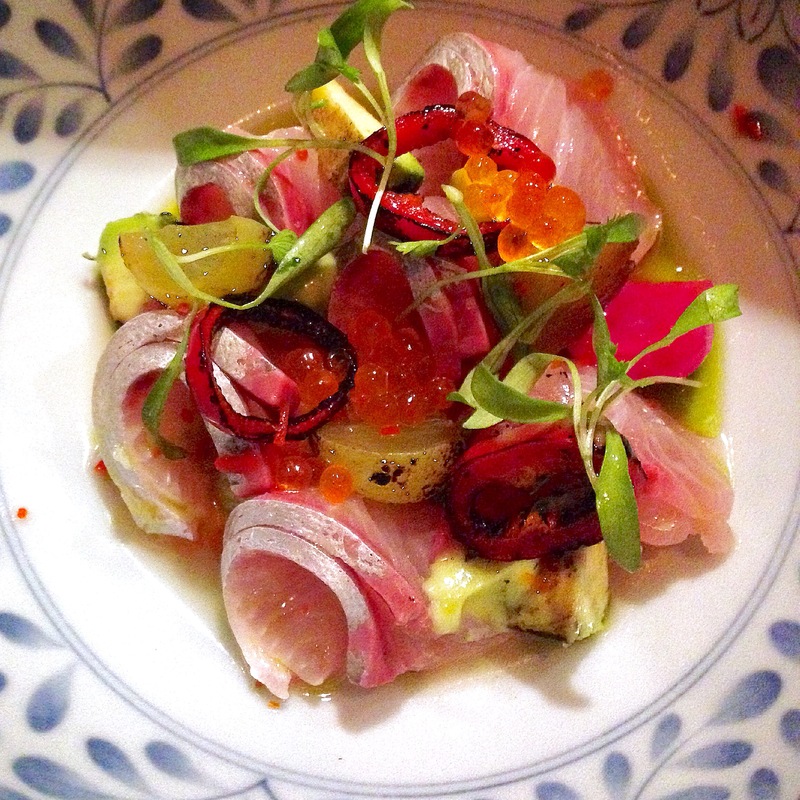 He suggests the Ceviche of Amberjack with charred avocado, Fresno chilli, grapes, cilantro and trout caviar. It is absolutely mouth-watering. Just reminiscing about it now makes me want to drive one hour just to order it. It is one of those dishes that you go to a restaurant for. The amberjack, a fish I had never tried before, is soft and tender, it melts in your mouth but it is fresh and flavorful without being fishy. It is garnished with just the right amount of lemon marinate, the most beautiful sweet chilli and the softest avocado, smoked to provide the wooden and mature taste that the rest of the freshness needs. It is indeed one of those dishes that I will remember. Simply stunning yet dramatically simple. There is barely any cooking required for this dish, it is the most delicate yet bare recipe. The secret is obviously on the marinate. It has all the citrus flavor of the lemon but non of the acidity and it manages to balance the fish and the avocado to perfection. 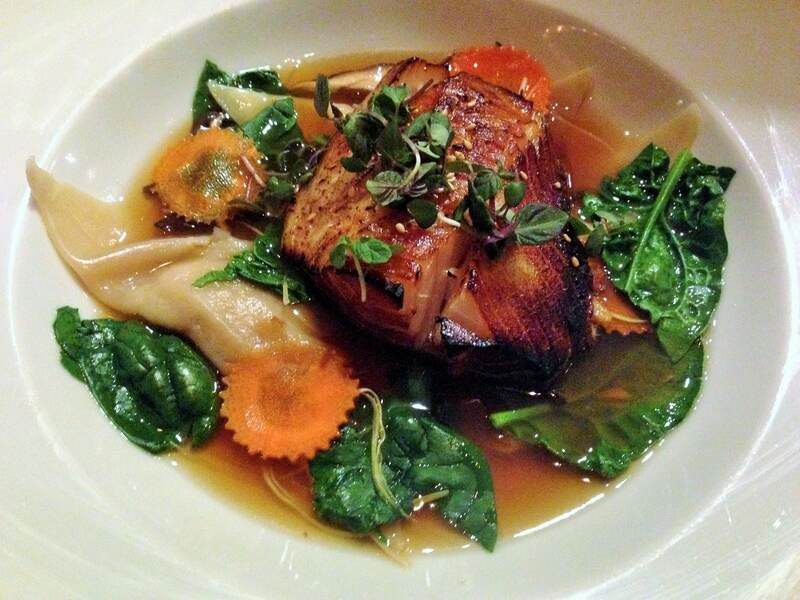 I could go on and on about this achievement of humankind but I have to move on to Ame’s, and actually Terra’s, signature dish: the Broiled Sake Marinated Alaskan Black Cod and Shrimp Dumplings in Shiso Broth. The cod was soft and flaky, just how it should be, but its texture and richness offset the lightness of the ceviche. The shiso broth in which it is served is extremely clear yet overwhelmingly strong. The prawn dumpling is dense and pressed. Had I not known it was filled with prawn I could have believed it was pork because of the powerful flavor of the broth. The fish lay on a bed of sliced carrots and spinach which looked messy and out of place but provided a respite from the richness of the broth and the fish. The overall flavors were extremely overpowering and half way through the dish I felt heavy and full. By the time I was done my lips were sticky with the fish’s fat. I needed some sake to wash down the flavors. I had been keeping the bread as the saving grace should I be hungry by the end of the meal. I forgot I am in the US where portions are always more than enough and for a fine dining restaurant Ame serves filling and adequate portions that won’t prompt you to stop at Macdonald’s on the way back. Despite being absolutely full I needed to munch on some bread to clear my palate and soak some of the grease. The beautiful Daiginjo Konteki sake from Kyoto the waiter recommended also went a long way in cutting through the richness, not to mention that it had a beautiful name translating into Tear of Dawn. I wished I wasn’t driving because the sake menu was extensive and intriguing. Some of the varieties of sake on offer come from the least known areas of Japan. For a limited period they offer Fugu Fin sake served with a piece of the fish’s fin. The dried fins are submerged into the sake and provide it with a peculiar, or shall I say utterly disgusting flavor? My neighbors order it – following on their “I’m here to impress and live to the limit” attitude for the night but the recognize, after a couple of sips, that it is simply gross. Despite the high price tag ($17 for 6 ounce) they leave it almost untouched and inquire with the waiter if anybody actually likes this concoction. My plate is finally empty, although I had to appeal to my inability to leave food on the plate to finish it, and I am happily making my way through the crunchy rustic bread roll, it has a thick crust and an airy heart. The restaurant decoration and utensils have a balanced Oriental and Earthy look. The bread has been served in the classic white plates but the butter, salt and pepper mill come in the type of serving plates and containers that my grandma had in our farmhouse: terracotta and clay. They align with the bread perfectly but somewhat contrast with the Japanese menu. The walls in orange and the white of the tableware take me back to the land. After the cod fish and, despite being completely full, I can’t help but want to look at the dessert menu. I have read that Lissa started as a pastry chef so I am expecting to see wonderful creations in the kitchen to finish off the meal. I am not disappointed. There are a few options that I would go for and I truly have a hard time picking just one. I resort to crow-sourcing resolution but the waiter’s lava cake recommendation is not my cup of tea. I have had too any chocolate lava cakes to know that they are always great, there is effectively no risk and no merit in preparing a good one, but I want to see the kitchen’s skills on the dessert section so I opt for the Baked Alaska. What a great choice it was. For those less familiar with the icebergs of the dinner menu, a baked Alaska is a meringue cake with heart of ice cream. 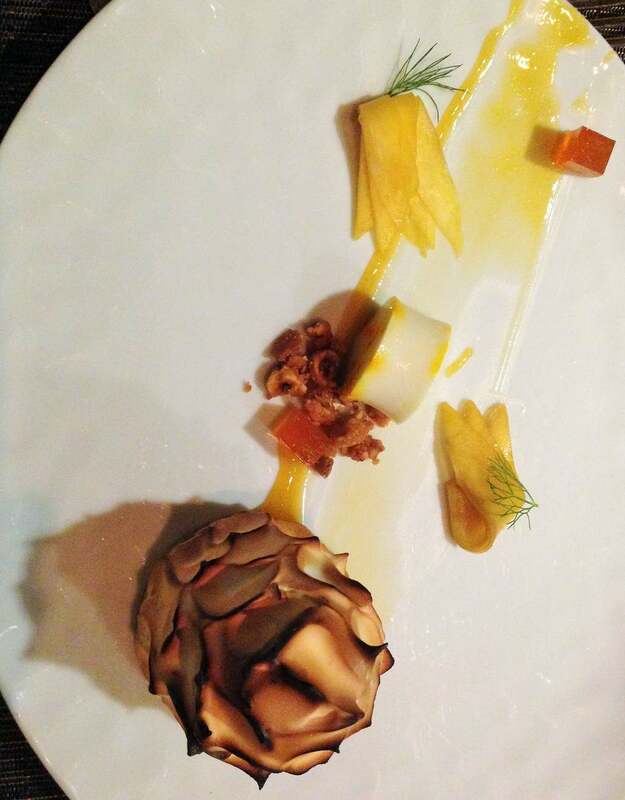 At Ame the Alaska comes filled with vanilla ice cream and mango-passion fruit sorbet. it is absolutely delicious. The meringue is crunchy on the outside but creamy on the inside. It has a baked crust that can be crushed with a spoon but a soft inner goodness that no lava cake can top. Being an ice cream fan this is just a 100% rounded experience. And I didn’t even have to choose between sorbet or cake! I devour the Alaska which comes decorated with some slices of fresh mango and a coconut jelly. This is one of those desserts that will stay with me, much like the ceviche. It is sweet without overpowering and it requires skill as well as class. I truly enjoyed my choice. Needless to say, as expected from a restaurant whose sibling is on the Napa Valley, the wine list is impressive. There are over 50 half-bottles to choose from, inheritance from the drink & drive limitations in California and the need to get a car to go anywhere. Living in the tiny city of Singapore where owning a car is just not an option I had forgotten about the barriers to enjoying a night out to the fullest. I settle for just a small glass of sake, which seemed like the appropriate choice, but I look at the wine list with devotion and curiosity. There are wines from regions in the US I never knew were wine producing. The list is so extensive that there is space for niche products such as sparkling wines from Portugal or Oregon.